In Art Deco > Show & Tell and Art Glass > French Art Glass > Show & Tell. this small pitcher / ewer complete my schneider collection. 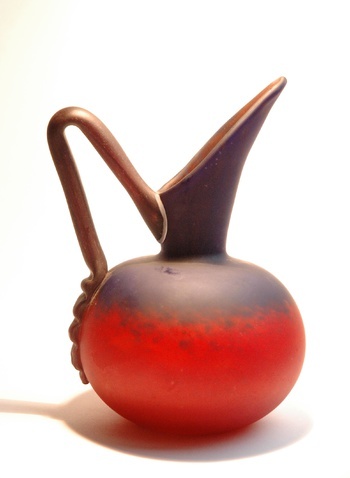 it is an early piece, produced between 1918 -1922 in epinay sur seine, with blue and red colours and purple applyed handle and satin finish. it is signed under the handel in gold enamel. would like to see more views and photos of this stunner . Magnificent......it just takes my breath away! Awesome pitcher style pottery! I'd like to see your whole display of West German pottery!!! hi shareurpassion, it is not a pottery pitcher and not west german-) i i don't collect west german pottery , you probably mean some other CW member.